In the Kunsthistorische Museum of Vienna is an old renaissance recorder with a wide bore and a large flair in the bell. This instrument is believed to be similar to the instruments Sylvestro Ganassi may have used. 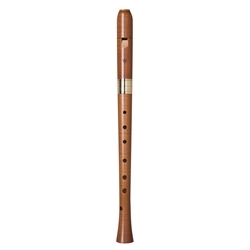 Our Ganassi recorders have a large bore like the Vienna instrument and will play the most demanding music of sixteenth and seventeenth century Italy. Our Ganassi alto recorders are pitched at a=440 and play in the key of F. Upon special request, our Ganassi alto is available with innovative keys for low F and F# not only to help the reach to the bottom hole, but also to facilitate playing F# without having to shade the bottom hole. While these keys are a completely modern addition to this type of instrument, we have taken care to design them for an authentic historical look.